In what feels like a new springtime of his life, Gaither Vocal Band lead vocalist Michael English is poised to release a solo album whose songs reflect what he calls the “good, fun, positive, upbeat” place where God has brought him — far removed from the long, lonely, but also long ago winter of his discontent. The new album, produced by Jay Demarcus of country supergroup Rascal Flatts — Jay is a former contemporary Christian artist (East to West) with deep Southern Gospel roots — will closely resemble an earlier record that English unabashedly considers the favorite of his personal recordings: Gospel, from 1998, which also was produced by Demarcus. At press time, English hoped his new album would be ready to release by April of this year, if not sooner. His 11th solo album will be the first in more than four years, since the February 2008 release of The Prodigal Comes Home (which was accompanied by a same-titled autobiographical book). In contrast to that 2008 album — as powerful as it was in conveying weighty matters of what he calls “failure and grace,” confession and repentance, forgiveness and restoration — English says the new (as-yet-untitled) album turns back toward “the music I love the most,” good old gospel tunes that exude the hope, joy and peace of walking with Jesus through the ups and downs of everyday life. One sure-bet tune on the record is “I’d Rather Have Jesus,” not only because English loves it (it was one of the last songs not to make Gospel), but also because God used it at a pivotal crossroads in English’s life. English mentions another past album — Heaven to Earth, from 2000 — to draw a further distinction with his forthcoming record. Lest anyone wonder, English is quick to point out that he doesn’t believe he has “arrived” at some trouble- free utopia — and that nothing he has overcome has been by his own strength. As he thinks about walking with God in this new season, English compares it to the GPS navigational system in a vehicle — and the friendly voice that says “rerouting” or “Please take the nearest U-turn” when we go astray. Still, make no mistake: English does not dwell in some candy-coated dream world, above the fray; he retains a penchant for delving deeply and honestly into real-life struggles. When asked about any family news he’d like to share, for instance, English chooses a path of relational vulnerability. English also remains aware of — and takes pains to articulate — the truth that restoration and healing don’t always result in exactly the kind of overcoming and flourishing that he has experienced. English’s solo album is but one aspect of his musical endeavors, of course. 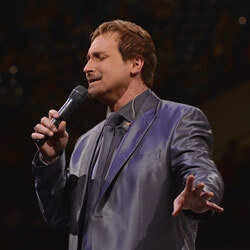 Longtime fans know that he sang with the GVB from 1987 to 1994 and rejoined the group in 2009 as lead vocalist. The band has released four albums in that action-packed, two-year span. English looks forward to another full slate of GVB performances and recordings in the days ahead, in addition to his new personal project and life with Marcie and the family. For him, by grace, spring has most definitely sprung again. Would He Ever Sing Another Gospel Song? On May 6, 1994, as the audience watched Michael English accept the last of his four honors at the 24th GMA Dove Awards in Nashville, you could sense his unease. He looked down at the award, shook his head, and mumbled words along the lines of, “This is going to be hard.” After an awkward half-second, he walked offstage to thunderous applause. A few days later, it became clear why English had looked downcast at what should have been a pinnacle of his life and career: an adulterous relationship on tour, a pregnancy, a miscarriage, a looming divorce and English returning his awards. For more articles featuring Michael English, click here.